Click this link to receive rebates on Interceptor Plus. Heartworm protection and saving money, a winning combination! We are offering 1 month free heartworm and flea prevention for new puppies! Call 706.370.7594 or email: info.nationalspayalliance@gmail.com to make an appointment! Flea/tick season is here with a vengeance! We have a solution and a special for Revolution for cats! Have a dose applied in house for $5.00 and purchase a dose for $18, that's 60 days of protection against fleas/heartworms/hookworms/roundworms and ear mites! Walk in Mon/Tues/Thurs/Fri to get in on this awesome offer! Thank you Whitfield and Murray County residents. With the grant money we had available we were able to spay/neuter 62 dogs! We have exhausted all of the funding. Feral Grant TNR Program. This program will help feral cat colony caretakers. The grant will include the Spay/Neuter at no cost to the caretaker, and the Rabies vaccinations. 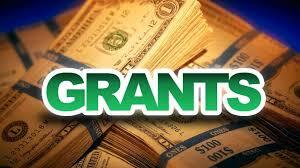 All additional fees are covered under this grant as well. This opportunity is possible through the generosity of Community Foundation, Georgia Dept. Of Agriculture and our clients and donors. Our monthly vaccine clinics were so popular we decided to offer our $10 vaccines and heartworm testing EVERY Tuesday. Walk in between 9:00 - 12:30 and 2:30 and 6:30 to take advantage of this pricing! We are staying open an hour later so everyone can take advantage of this deal! ​The $10 Tuesday vaccine pricing does not apply to surgical patients on the day of surgery. ​We are very excited to introduce our new on line store! You can purchase medications and food at low prices and have them shipped directly to your home! 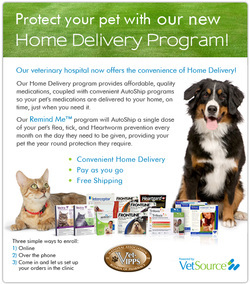 VetSource is our newest way to making your pets health care less expensive and convenient! Click on the link above or below and check it out!